Sister Rosalie is a native of Chicago’s west side. She is the fifth child of Albert and Zofia Major who immigrated from Poland when they were teenagers. The family totaled seven children, one of whom was adopted at three months of age after a train accident left him orphaned. During her elementary school years, Sister Rosalie made the acquaintance of a Benedictine priest, Father Hilary Jurica, O.S.B., who was influential in introducing her to the Sisters at Sacred Heart Monastery. After eighth grade, she visited the monastery for two weeks and was attracted by the lifestyle of the Benedictines. 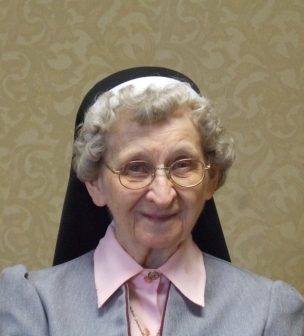 Sister Rosalie attended Sacred Heart Academy and entered religious life in August of 1936. She made her simple vows in 1938 and her final vows in 1941. Teaching was to be Sister Rosalie’s life work, forty-three years in all! She received a B.A degree in Elementary Education from DePaul University and did graduate coursework at the University of Dallas, Loyola and Maryknoll. Her first twenty-five years of teaching were in a variety of Catholic schools in Chicago and Texas where she was twice one of the pioneering Benedictine teachers. The second chapter of her teaching career was spent in Montessori schools at the primary and elementary levels. Rosehill Montessori in Lisle is her namesake. Sister loves folk dancing and had performed acrobatics from a young age. During her years of teaching, she was involved with children in these areas and arranged many stage performances for special occasions. She also taught religious education classes to the children of the servicemen at Carswell Air Force Base. In addition, she worked for five years at St. Joseph Orphanage (now Benet Academy), caring for young girls and teaching 3rd and 4th grade. At the monastery, Sister Rosalie initiated the rosary devotion nineteen years ago and enjoys sharing this time with the residents of Benedale Center. Now retired, she prepares welcome banners for new residents who come to live at the Villa St. Benedict’s assisted living facility. Too, she sends residents birthday cards and makes corsages for them for their birthdays. She delights in visiting with and singing with her neighbors at Villa St. Benedict. You will often find Sister Rosalie at the computer emailing friends. She loves to keep up on current events, helps out at the reception desk and enjoys listening to classical music. She gives thanks to God for the blessings He has bestowed on her throughout her religious life as a Benedictine.